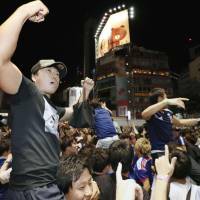 Regardless of how Japan fares in the knockout stage of the World Cup in Russia, many businesses back home, from pubs and restaurants to electronic shops, are already counting the global sporting event as a resounding win. “We have seen a massive increase in sales when the Japanese national team plays,” said Mark Spencer, owner of four Western-style pubs in Tokyo. Spencer estimated that sales can easily double when Samurai Blue plays — along with other popular teams such as England, France and Australia — partially the result of the extension of his pubs’ operating hours into the early hours of the morning so viewers can watch the games live. Having opened his first bar in the early 2000s, Spencer is familiar with the spike in business that a World Cup can bring, explaining that the best tournaments for sales tend to be the ones that feature matches at night, when many people can watch at pubs near their workplaces or homes. Larger chains such as Dominos Japan Inc. have also kept their doors open later than usual, in order to cater to the crowds who decide to stay at home to relax, eat pizza and enjoy the matches. Around 50 Dominos locations nationwide have extended store hours until 1 a.m. for the three Japanese matches, with overall sales surging around fivefold compared to a normal weekday, according to Emi Sugino, director of advertising and public relations for the company. Beyond simply watching the games, many fans also decide to shell out money on team apparel in order to show their support and it has become a common sight across the country to see fans on the streets or riding trains dressed in blue. “While we can’t divulge actual sales numbers, we are expecting strong sales of jerseys as a result of the national team’s play, and people’s enthusiasm for the sport,” said a representative for Adidas Japan K.K. Other businesses, however, see an upswing in business months before players even take to the field. “We generally see a rise in sales of electronics a few months before major sporting events,” said a spokesperson for Bic Camera Inc., adding that sales may also be on the upswing because of other upcoming sporting events, such as next year’s Rugby World Cup and the 2020 Tokyo Games. 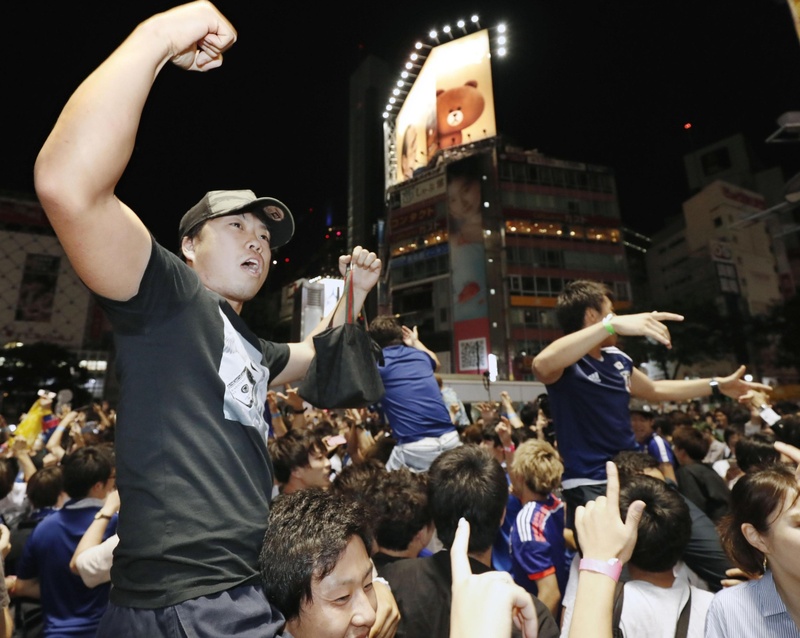 Although the overall impact of the World Cup is difficult to measure in economic terms, some predict that it has already increased consumption on a scale of billions of yen. Toshihiro Nagahama, an economist at Dai-ichi Life Research Institute Inc., estimates that the economic impact of reaching the next stage of the tournament could bring in total benefits of up to around ¥21.5 billion. Nagahama said he expects the economic benefits to be similar in size to the 2010 World Cup in South Africa, another tournament where both the Japanese national team advanced to the second round. Those games also aired at night.